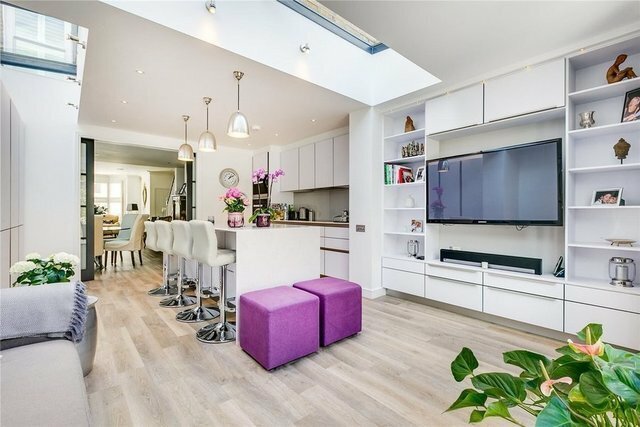 A superb three bedroom Victorian terraced house in this popular enclave of Fulham. This stylish property has been thoughtfully designed throughout to provide elegant, well balanced accommodation which has been finished to exacting standards. As such the house offers excellent family and entertaining space on the ground floor including a modern open-plan kitchen with breakfast bar and a sitting/TV area with bi-folding glass doors opening onto a beautiful south-facing sunny garden.The master bedroom on the first floor is an excellent size with plenty of built-in storage and an indulgent en suite bathroom. There is also a further bedroom with a family bathroom to the rear. On the second floor, there is a further double bedroom with an ensuite bathroom and extensive built-in storage.